15/11/2011 - Driving a Formula One Ferrari is a dream that normally is not accessible, but that was not the case of the winners of the Italian Formula 3 Championship. In fact, thanks to Scuderia Ferrari and CSAI, the Sportive Automobile Commission of the Automobile Club Italy, the protagonists of the tricolored series powered by Fiat Powertrain Racing had the privilege of completing a whole testing day at the wheel of the Ferrari F60 as happens now since 2008. This dream came true today for the Modenese driver Sergio Campana, that is the new Italian Formula 3 Champion, and for the Californian Michael Lewis, the new rookies Champion. The couple has been protagonist of the prestigious Italian series that reached the 46th edition. The working programme followed by the two young talents was intense and done under the careful supervision of engineer Luca Baldisserri of Ferrari Driver Academy. The first to get on track at 9 sharp was Michael Lewis who had the exclusive on the 4.085 meters of the Roman track of Vallelunga for a total of 50 laps divided in 6 stints of 7/8 laps each. At 13.30 it was Sergio Campana's turn to get on track with higher temperatures (10 degrees Celsius more than the 8° C measured early in the morning). The Modenese also completed about 50 laps which was nearly twice as much as last year's award winners had the chance to run. Information exchange has been continuous between the drivers and Scuderia Ferrari's technicians at every pit stop and time improvements were constant as laps went by. The best time of the day was set by Campana in 1'20.6 while his younger colleague scored a fastest lap of 1'21.0 when the track was colder. "I cannot explain my feeling" - commented Campana, visibly thrilled - "feeling that engine pushing, aerodynamics flattening you, brakes allowing you to brake nearly inside the corner, gear shifts in thousands of seconds. Formula One is fantastic! The Ferrari Formula One car is fantastic! For an Italian driver it is something unbelievable. I reckon that from tomorrow on I will fill the walls of my house with today's pictures. I am hopeful I left a good impression. I do not know what will happen in the future and I do not even want to think about it now, I just want to enjoy a bit this moment. Continuing my career with single seaters would be fantastic". "Unbelievable, unbelievable, unbelievable" - that's what Lewis shouted once out of the cockpit - "I was sure I would have felt strong emotions but I would have not believed this much! Everything here is multiplied compared to what I am used to do while driving a Formula 3 car. It is really tough to get to the limit but it is exciting to feel all that power and that force in fast corners and under braking. Everything is multiplied but the car's dynamics is the same. There is no doubt that Formula 3 is an extraordinary school allowing me to reach this moment ready. It is fantastic to have this experience behind the wheel of a Ferrari Formula One car. It is a dream for everyone, and it is so also for an American like me". "I cannot be grateful to Ferrari once more" - commented CSAI's President Angelo Sticchi Damiani - "Thanks to them we can provide the talents bloomed in our championship with a dream experience. I hope that this kind of things, as well as the collaboration with Ferrari Driver Academy that sides us all the way through from Karting, Formula AciCsai Abarth and Formula 3, will make true our dream of seeing one of our drivers competing at the top of Formula One". During the press conference introducing the 2012 season for Formula 3 and Formula AciCsai Abarth, the most awaited news arrived too. 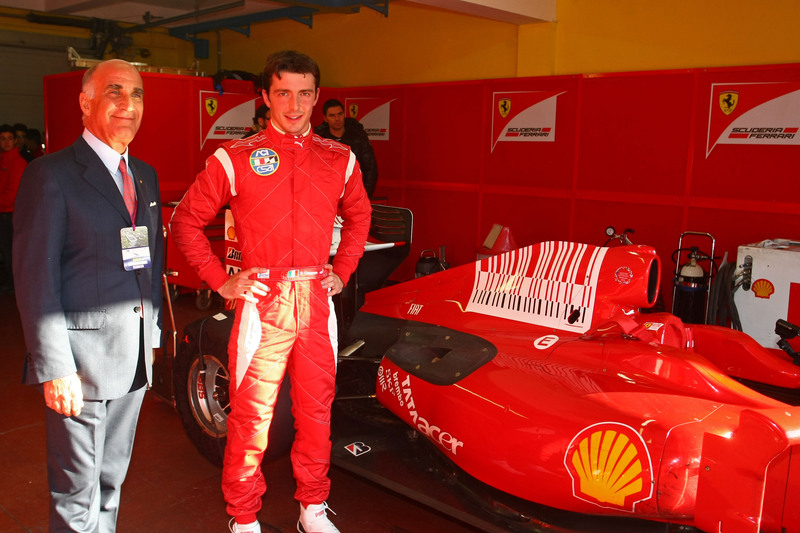 Luca Baldisserri, manager of Ferrari Driver Academy, announced in fact that the Ferrari F.1. Award Test will also be confirmed for next year. "We are delighted to confirm that the prize drive will continue next year and will be reserved to the absolute winner and to the best rookie. The single seater used for the test will be the 2010 challenger, that is the car that almost won the F.1. World Championship. Our commitment with the youngsters in the F3 Italian championship has all the reasons to be renewed. I have to say that our partnership with the tricolored series is not due to the fact that we are an Italian constructor. The Italian Formula 3 is certainly one of the top national championships in the world and the good things done at the wheel of a Formula One car by the two young drivers today since the beginning proves it. The same happened to their predecessors and it is not by chance that Mirko Bortolotti and Daniel Zampieri, two of the most recent Italian Formula 3 Champions, are pupils of our Ferrari Driver Academy. We hope to find a future World Champion on the Ferrari with this commitment".